Whether you're using the Child Check-in system or a manual child check-in process, ChurchSuite makes child attendance recording really straightforward. As your church's child attendance data grows, there are some helpful child attendance reports that will be useful to plot and track your attendance metrics. 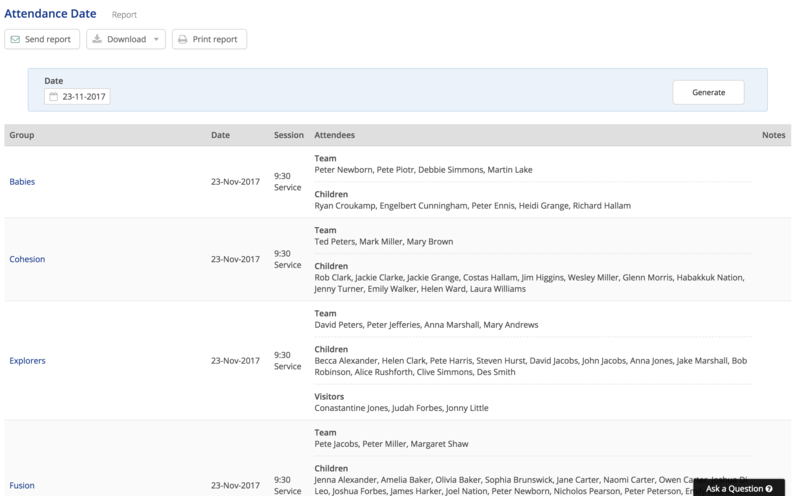 In this article we explore the various Attendance reports in the Children module's Reports section and also show you how you can view individual child and group attendance. The Attendance Date report displays a list of all team, children and visitors in attendance on a given Date on a group by group basis. The report displays all sessions for all gatherings on the given date. This report is ideal for churches that would like to produce a hard copy record of group attendance for a date for safeguarding purposes. Clicking through to any group from the report results will take you to the detailed check-in/out data for that group/session - divided into two tables - one for children recorded as attending and another for children recorded as registered by not checked in. The Attendance Percentages report shows each child's attendance as a percentage for each group over a range of Dates. Filter the results by Groups, Tags and/or an Attendance % range. Order the results by child name or attendance %. If a child is in multiple groups (i.e. more than one Gathering is filtered in the report), they will be included in the report for each of their groups, with their % attendance for each group. The Attendance Summary report provides a simple attendance register for all sessions within a fixed Number of weeks up to a defined date. Using the filter options in the blue shaded box at the top of the report you can filter the report to show specific Groups or all groups, and further filter by children in particular Tags. Children with zero attendance during the date range can be excluded from the report, and the results can be emailed, downloaded or printed. Hovering over any of the green attendance ticks will show the group and session the child was checked in to. Note that the maximum number of weeks that can be reported is 12 weeks Ending on a defined date. The Graph Generator is a super useful tool for tracking the growth of your children and youth groups over time. 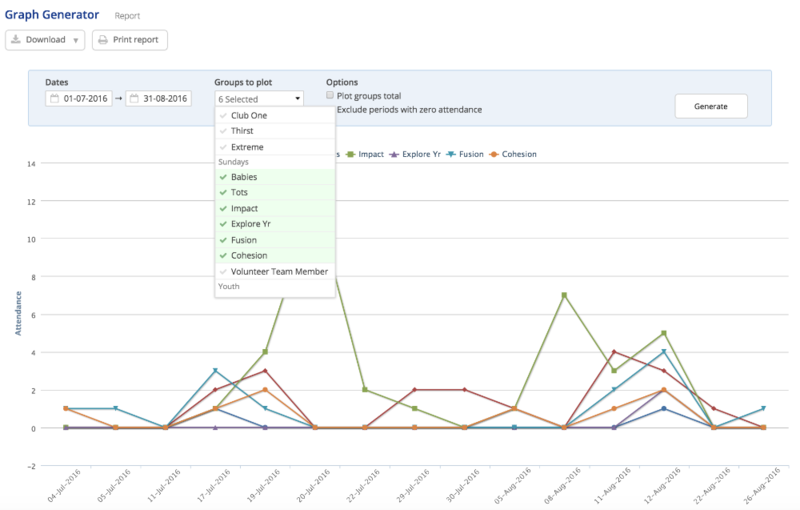 The graph plots each meeting's attendance total and then links them together allowing you to see at a glance the attendance trends within your groups. You can even filter multiple group's data (perhaps your youth groups) on the same graph allowing you to compare growth and track patterns. The graph is also tailorable for whatever time period you want allowing you to take a wide-angle perspective over a longer period of time (e.g. a year), or a more closer perspective, perhaps across a term or a teaching series. The Monthly Breakdown report is a comprehensive report capable of providing headline metrics from your children's ministry as a whole, or for a selection of Groups to plot. In its simplest form this report displays the total number of attendees each month for a group in bar chart form, and then plots the average weekly attendance by overlaying a line graph. When used to plot multiple groups, the graph displays each respective group's monthly totals in colour-coded blocks and also a combined total for the month. The report can be filtered by calendar Year, allowing you to easily see attendance trends of your groups or entire children ministry. 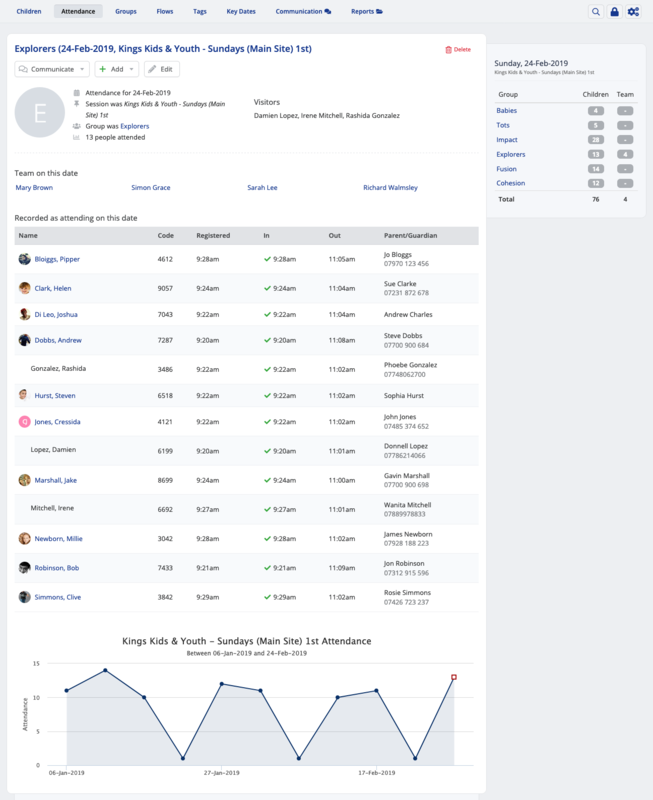 Scrolling down the report page there is a breakdown showing the number of children contacts and visitors each month and weekly average. Use the No Attendance report to easily view a list of children who have not recently attended one or all of your Groups within a specified range of dates. The report can be ordered by Groups or child Name, and filtered for all groups, or for a selection of groups, or just those children within a certain Tags. From the report you can then directly communicate with children and/or their parents, or download or print the report if you wish. You can also 'tag' all the children in the report results, perhaps to follow up with them further outside of the report - click Add to tag. If your church runs multiple check-in Sessions for the same Gathering (perhaps because you repeat your children's groups in your various Sunday services), then the Sessions attendance report will be really useful. 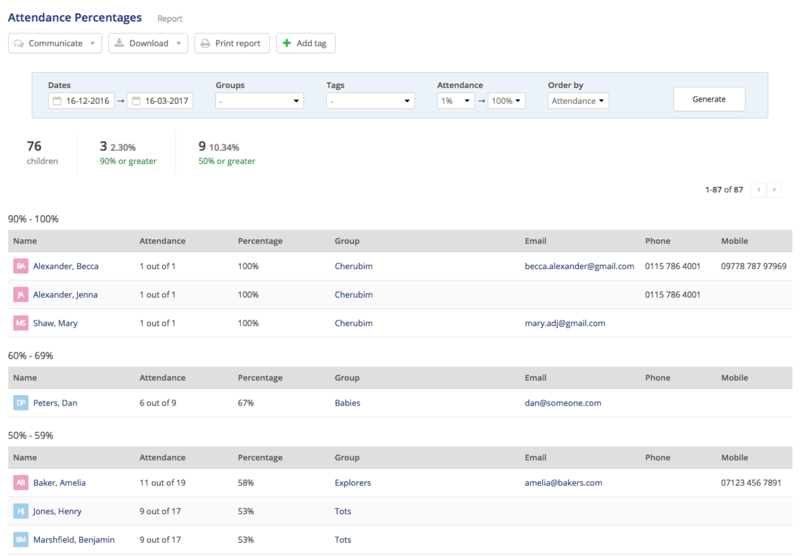 This report works just like attendance Graph Generator but with the additional option of being able to compare and contrast the check-in Sessions for your groups. 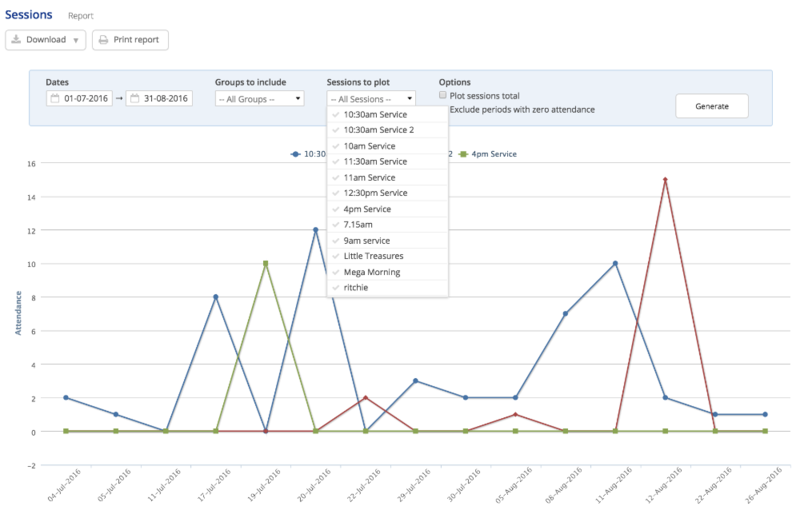 So you can easily compare your Creche check-in attendance at the AM1 service vs. the AM2 service! Plotting this report over time will allow you to see attendance trends, perhaps identifying which groups within which services are growing, and at what rate. It's an important indicator that will inform team recruitment for your children's ministry. 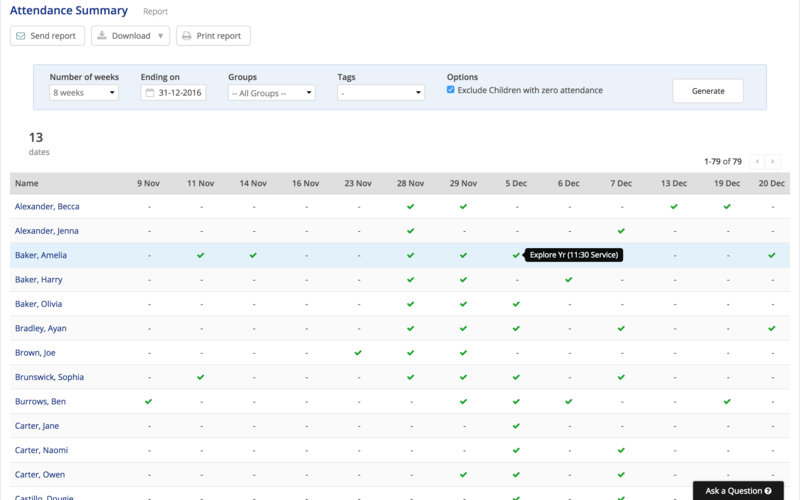 When viewing a child's profile within the Children module there's a Recent Attendance summary. Clicking to View all attendance will show you a record of the child's full attendance, including dates, sessions, and times when they were checked in and out, if appropriate. Whether you add attendance manually from printed attendance registers, or record attendance automatically through the Child Check-in system, all your groups' historic attendance data is retained within the system. In fact, child attendance is maintained against each group even if a child leaves the church and is deleted from your Children module! 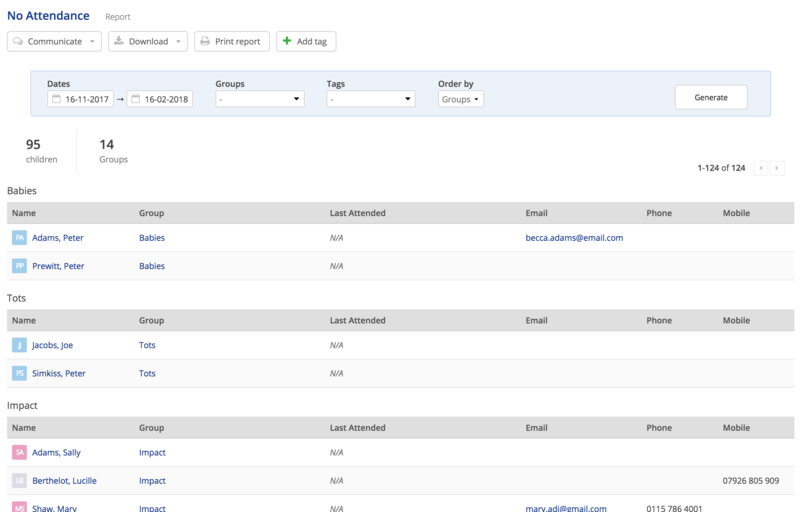 As long as the group is not deleted (you can archive groups), historic group attendance data, inlcuding a list of names, is retained in the system indefinitely. 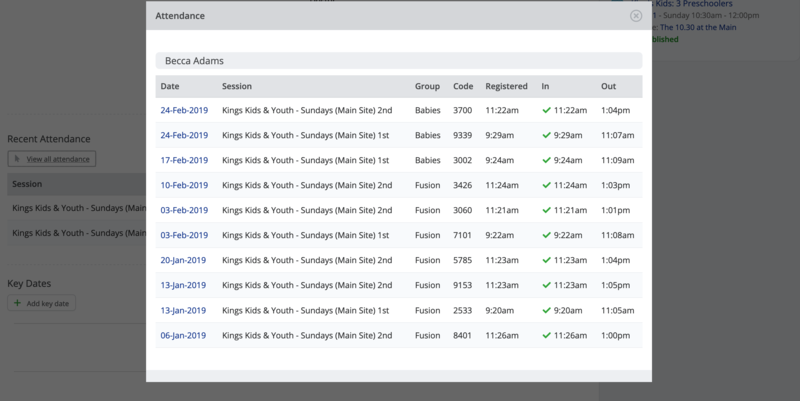 In the Attendance section of the Children module, selecting any attendance entry for a group will display a detailed list of all the Children, Visitors and Team attendance for that group for that date, including the child check-in/out time stamps. The page is divided into two list - the first showing children recorded as attending and the other showing children recorded as registered by not checked in. On the right hand side of the screen are links through to the attendance for other groups in the same session for the same date, along with stats for the total children and team checked in. 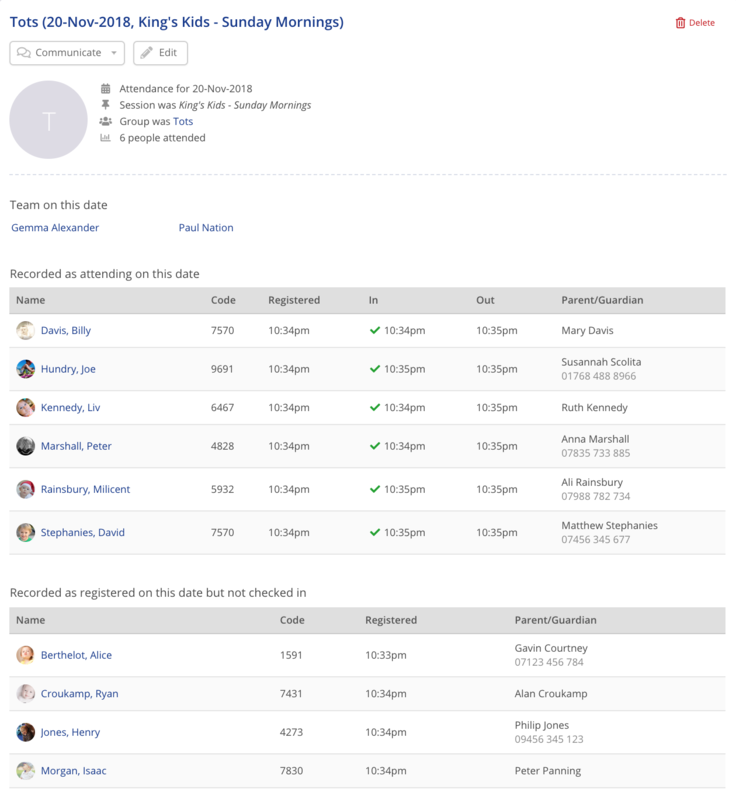 Note also the options to Communicate directly with attending children and/or their parents (not team or visitors) from the page; and also the option to Add children to a Tag, Key Date, or Flow.